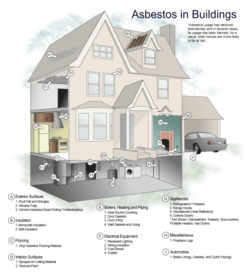 T he purpose of all asbestos surveys is to undertake a visual inspection throughout the property and identify fibrous materials likely to contain asbestos for subsequent sampling and laboratory analysis. Where appropriate for each use of asbestos identified a risk assessment is presented with conclusions where appropriate for remedial action. All suspect items identified within the visual inspection shall be sampled where accessible whilst maintaining the health and safety of both the surveyor and building occupants. Sampling is to be undertaken where possible in areas remote from building occupants. Personal protective clothing and face masks shall be worn during sampling and disposed of in an appropriate manner upon completion. Sampling tools shall be disposed of and discarded as contaminated waste upon completion. When sampling either break or cleanly cut the suspect material rather than drilling or sawing. Fibre release when sampling shall be collected in a plastic bag with sealed openings. Never remove a sample where asbestos fibre release cannot be contained and collected. All samples to be placed within two sealed plastic bags. The outer bag shall be labelled with a unique identification. All sample bags to be kept in a container labelled as containing asbestos. Upon removal of sample. The test location shall be sealed as appropriate either by paint and/or a double layer of heavy duty ‘Duck’ tape. No cut or broken edges to remain. Upon completion check no asbestos fibres have fallen to floor etc. Do not remove samples of asbestos-cement from boiler flues where the risk of damage may render the flue unfit for use. This may also similarly apply to other forms of dense asbestos-cement products.